Last week, during bad weather, my planned Thameslink train was canceled. Luckily, there were staff on hand at the station to offer advice, and I was directed to a local bus service a short walk away to continue my journey by an alternate route. Whilst on that bus, I overhead a few other disrupted rail passengers talking. One of them mentioned having looked up this alternate route on a map online, which was news to me, and might've saved some walking / would've saved me a lot of problems had the station been un-manned! In case of future reference, are these alternate route maps generally available online? And if so, where? 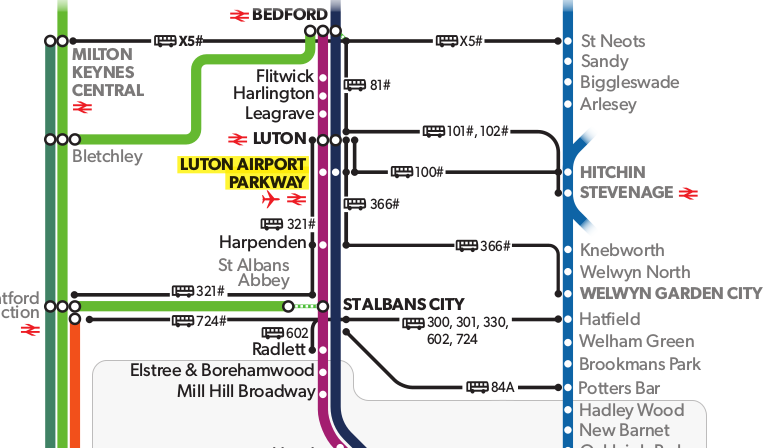 For Thameslink routes, the list of stations and their associated alternatives are here on the Thameslink site. For the semi-linked Great Northern routes, they're here. Are there any small towns near Edinburgh with good access to rural hiking routes? Are there any international train services in South America? Is there any mobile app with public transportation routes for Vitória, Brazil?